The Reserve at North Dallas was very adequate and priced right. The staff was excellent, and the food was good but not excellent. They had trips, outings, and in-house activities. I was satisfied with The Reserve at North Dallas while I was there. I was given a two-room apartment. At one point, my wife had trouble swallowing, and I was kind of desperate, so I asked the waitress who was in the dining room if there was any nurse available because my wife needed some medical assistance, but the nurse comes in at 3:00, so I concluded there is no nursing service there. The food was satisfactory and there was some variety but not enough. The people were nice. A very caring and responsive staff.The needs of each person is respected and there is a strong commitment to be available. The reserve is beautiful with a very cheerful atmosphere. Sherri Lynn was wonderful! We had a great lunch and tour. I was impressed with the cleanliness of everything and how welcoming everyone was. The. apartments are very nice. I was dreading the experience of moving my mother but In every way possible they accommodated us and the process couldn't have been easier.. I couldn't be happier with the experience. I found the Reserve depressing. It was so small, but the location was good. The staff was very nice, and the maintenance was good, but the rooms were small. They were having a get together with food and music when we were there. I was very impressed with how pretty the spaces were at The Reserve. The main objection that I had was with their location. Their rooms were spacious and beautiful, and the whole place was very well decorated, elegant, and so very attractive. They offered transportation, bridge, and many amenities. Town Village (The Reserve at North Dallas) was very nice and updated, but it was too big for my parents. We took them to visit this community, and it was really overwhelming for them. The rooms were very roomy and would have been great if my parents were a little bit younger, but being in their 80s, it was just not a good fit. We tried the food at Town Village North Dallas, and it was excellent. The people were wonderful and very friendly, and the residents came over and talked with my mother. The food was excellent. The place was newer, and we really liked it. We're considering moving her in there. They had a lot of activities, and they also offered in-house PT and OT. I found Town Village North, and I love it. I have been here since the month of July, and I absolutely love it; I am very happy here. The staff is absolutely fantastic. They are helpful, wonderful, and pleasant -- everything that I was looking for. I have a 1-bedroom, and it is very nice. The facility is very clean. I have been to a meeting at Town Village five to six years ago, and I have visited it again recently. The people were friendly, and it seemed very clean. The rooms were small but well-organized. The dining room was well-organized too. Residents were playing games, and they have bingos and trips. The atmosphere really impressed me, and the place appeared to be secure and safe. So far, it's going well. I don't know, but we still have to get things straight, and I feel like it's taking a little bit longer than I thought. There were a few balls that were dropped, but we are adjusting. My mom seems to be doing fine for now. Everybody in Town Village North Dallas has been really nice, but she still complains about the food although it looks OK. They contacted her, but it wasn't as fast as we thought it would be, but there is nothing bad or anything like that. When I visited, it was nice. I really liked the place when I visited. They do have a doctor that comes on site if needed, so we just have to hook up with that. We liked Town Village North because the rooms were larger. It was nice and pretty. There was a lot of stuff going on like bingo, bible studies, and trips to different places. The people were very friendly. The staff was very nice. My brother liked it a lot and in fact, he would have moved there if he hadn't needed the 24-hour care. They had services you could purchase but not at night. It was a much larger facility than where my brother was staying and would have to go further from his room like going down to the dining room. We really like the fact that there were some green spaces at Town Village North Dallas when we visited the community. The rooms were very nice and roomy. The staff especially the saleslady that gave us the tour was very nice. Their dining rom was nice and we like the food. It was very good. Although the facility needed a lot of refurbishing and the walks to the dining room were extremely long. They need new furnishings for one thing. They hadn’t renewed any of the furniture or there are a lot of walls that needed painting and carpets needed replacing. They need to freshen the community up. Thank you for taking the time to share your thoughts. Starting next month we will be undergoing renovations to give our community a facelift. We would love for you to keep us in mind and come back to see our progress! We visited several facilities, and one of them is Town Village. The physical and the interior design of the facility looked very nice. The staff was very courteous and accommodating for whatever a resident needed. We had a meal there, and the food was good. Their dining room is fine. The visit was a good experience for us. My mother was in Town Village North Dallas. She was in their independent living. But after she had the stroke, they said that she should be in the assisted living part. So we moved her but she wasn't comfortable being there. She needed more care yet they didn't have a lot of it. All they really do was have some people there that were more like babysitters. The staff was young and nice, but they didn't have any real knowledge or experience. There had to be some knowledge how to take care of people. They're weak in their assisted living. The apartment was nice and big but the price was almost three times as much as independent living. For the extra money, you would think you would get a lot of professional care from people that had some experience or took some kind of courses. The food was good and the dining room was clean. The place was always clean. The independent living was a great place, but the assisted living wasn't. In my opinion, either they have to re-think the whole thing and hire professional people or just get rid of the assisted living and make the whole thing independent. We just did a tour at Town Village. The facility was very nice and very clean. It was in a very wooded area and it was very nice. The people there seemed to enjoy this facility. Their rooms were very nice and I was quite impressed with them. They were a good size. They were small, which I could understand, but I just didn't think they were right for my parents at that time. The young marketing lady did a good job as she spent a lot of time with me. She gave me a lot of good information and I appreciate that. I did enjoy the facility during my visit there. When walking through the front door TVN is truly exquisite. The dining area resembles that of a fine dining restaurant. The staff was informative and patient when answering our questions. The rooms were nice size and had decent bathrooms. All of the current residents seemed to be happy to reside here. We were informed that there were multiple activities for the residents to participate in including games, exercise classes, arts and crafts, and even a happy hour! There was a cute deli/store located in the center of the facility as well. The residents could purchase coffee, soups, candy, ice cream, etc. There was a company van that provided transportation for the residents to Dr. appts and even the grocery store. There was an assisted living unit for residents who suffered from dementia. This part of the facility provided assistance with activities of daily living along with medication management. I felt at ease with this due to the fact that sometimes my mother would forget to take her medication. The staff was very cordial and understanding to the current residents as far as we could tell. I would recommend this facility to others. We are strongly considering it for my mother at this time. The Town Village North Dallas assisted living facility in the region was one of the places we saw while looking in the region for my brother's friend. The property looked well cared for as we arrived. We really liked the vibe in the lobby - which was clean and fresh with very nice staff to greet us and designed like a hotel or resort. Their library was impressive, with many good books and games. The fitness center had well maintained equipment and ample rooms with daily classes and the residents could safely navigate the lovely grounds with adequate supervision as necessary. The food we saw looked and smelled delicious. Healthy snacks are offered all day and into the evening, as well as whenever residents request them. The meal menus all had healthy food options for all kinds of diets. The dining room was quite nice, with plenty of space. The safety of the residents is assured since they have an emergency call system so that someone is always available in case assistance is needed. The living spaces were generous, with nice sized rooms. The residents are taken to many interesting events in the region -- to take advantage of the vast and diverse culture. The many planned activities feature everything from book readings and discussions to the arts, for museums, galleries, film and theater. This is a full service senior living community with very attentive staff -- and we could see how anyone would really enjoy living here. My Aunt lives in this facility and I visit her regularly. The facility is beautiful, comfortable,and has wonderful staff that are always willing to help and be of any kind of service to the people living there. There isn't a nursing home feel to this facility as there are with many others. This place is wonderful because beause they treat the residents in their community with respect and actually help them do different types of rehabilitation in case the client wants to eventually move out again on their own, or just to benefit their health and well being. I think its great for any type of senior, and exceptional for those who are active as it promotes this atmosphere and there is an overall feel of positivity; which I think makes people feel more at home, comfortable and happy to be here.My Aunt has also met many other active seniors living in the community, whom she has become great friends with. I would definetly recommend Town Village North over other facilities in the area. I really liked The Reserve at North Dallas. Its set up reminds you of a hotel. It has a Bristow on the left when you walk in. I went to an event that they had there and they were playing music and they had snacks out. You walk straight through, there's the dining room. They took me up and they showed me a two-bedroom. It was really nice and very spacious and I liked that. They had an area out back where you could go out and walk. The facility will go from independent living to assisted living. They had people in my age range who were mobile and liked to travel. I went back and took my mother-in-law there to see it as well and we both liked it. The staff was excellent. They revamped the whole facility and they had changed out some staff. It was really a good facility. They had a sewing room. The whole setup was very appealing. Their food menu looked really good, and the snacks I had were excellent. Thank you for sharing your personal experience visiting our community; we appreciate your feedback! They have good staff here at The Reserve at North Dallas. I have an efficiency apartment with a kitchenette, a full-size refrigerator, and a stove. The food is pretty good and they have a big dining area. The grounds look nice. They have a library. The Reserve at North Dallas had more of a nursing home atmosphere, which wasn't alright with us. The median age seemed to be older. The staff was wonderful there, and the food was great. The apartments were smaller. There was nothing wrong with the facility. It just didn't have a balcony and you couldn't get to the outside from your own apartment. They also did not have underground parking, which was very important to us. They let their residents sit out front in wheelchairs like a nursing home and I didn't like that. They also sat around in the lobby and that was just too much like a nursing home for me. Barbara, we appreciate your feedback, and were sorry to hear that your visit at The Reserve at North Dallas was not a five-star experience. We use feedback to help us meet our continuous improvement goals and would love to hear any additional thoughts or comments you may have. Please feel free to reach out to our Executive Director at our community phone number. Thanks! I have nothing but praise for The Reserve at North Dallas Senior Living. After an exhaustive search through the entire DFW for the very best senior living facility for my father, I found this wonderful community. Being extremely selective about the amenities my dad's new home needed to be able to provide him with, I was thrilled to discover he could find everything right there. From the first visit, he and I noticed how considerate and warm the entire staff was and how friendly the other residents were. Not only is the community gorgeous (having had a full face-lift), but it has a full roster of activities, on-site home health, and a great location for shopping and doctors. Medical City is right down the road and transportation for the residents is easy to schedule. We tasted the menu and loved all the choices of food, as well as just plain felt like we were exploring a luxurious resort. My dad has since moved in and is the most content I have ever seen him, with no complaints. For the first time ever, I feel that my father is living a full life in an environment where he is truly cared for and appreciated. I fell in love with the lady at The Reserve at North Dallas who was giving us the tour. It was a beautiful place, and the people were extremely friendly. The rooms were well-done and immaculately cared for. There wasn’t a thing that wasn't top notch. It is a very nice up-to-date place and well run, and it is a privacy situation for my friend, but yet he has people at his beck and call if he needs them. He is in his second month at Town Village North Dallas. We chose it because of the ambience. I like the open atmosphere of it. It's airy, and there are a lot of windows in the dining area. It is just aesthetically nice. They're doing some renovations, and I can see that it's really going to be an excellent atmosphere when they're through. They're not intruding on the people's privacy at all. They do a lot of the work at night. They have games and an active game room. I've eaten there numerous times, and the food is good, tasty, and well done. The portions are small, but I don't hear any complaints. I would recommend this place. The only negative thing that I would have to say about it is that it takes so long for them to get waited on for their food. Sometimes, they don't wait for their dessert, and I've seen that happen several times. Town Village is very nice. There’s nothing wrong with it, but my budget couldn’t afford it. There’s a ballroom for dinner, and it was very well organized. The rooms are very nice, and it has a study that goes with it. The kitchen was very nice too with a nice refrigerator and dishwasher. The only thing I would object to is the second floor. Also, there is no space for your car. You park wherever there is an opening. They're very nice and welcoming at Town Village. The girl who took us around knew most of the people there. She was able greet them by their first names They were really very nice. We went back probably three or four times, and they were certainly open to whatever questions we had, and going back and seeing the apartments and whatever was needed. It is an older facility. But they are in the process of doing some renovations to the facility. My mother-in-law is Jewish and it is very important that she has a community where there were quite a few Jewish people around her. And they are actually 68% Jewish there. The apartments were very nice. They actually upgraded everything. They're very modern. Kitchen has granite tops with all new appliances. They were stainless steel so they were very nice. They do bridge, mahjong, outings, art classes, exercise classes, and they work very closely with the Jewish community center which is not far from there, so that is huge as well. Town Village is okay. It is a lovely place with very nice people. Its prices are also very reasonable compared to some of the other facility I saw. The only complaint I would probably have would be that it is owned by such a large corporation. I think when you have a large corporation it is just more difficult to run an independent living place more personally. They probably need to listen to their residents more and understand that, even though they are run by a large corporation, they still need to be a little bit more sensitive to the needs of the individual resident. Food is sometimes wonderful and sometimes they're not so great, but they're not horrible either. They have chef and a huge variety of food from a menu. Regarding staff, some of them are very good while others are just kind of so-so. They do have good activities there. Their apartments are wonderful. They're terrific and they're great sizes. The best about Town Village North was that they had washers and driers inside each unit. The residents don't have to go down the hall in these community washing machines. They had a nice dining facility. However, the building was very spread out so some of the rooms were too far from the center area. Senior assisted living at The Reserve at North Dallas offers residents the best of both worlds. All benefits of our senior living community are combined with a full spectrum of senior care services to create a premier senior assisted living community. Residents enjoy beautiful surroundings, on-site amenities and social programs alongside continual on-call care. At The Reserve, we adhere to state-of-the-art standards of senior assisted living while providing a special touch. Our residents receive personal and comprehensive care and are consistently treated with the dignity and respect they deserve. Whether our residents need help with day-to-day activities, getting to appointments, or medication management, our caregivers kindly and competently meet those needs. Our assisted living community in Dallas has been purposefully designed to provide you or your loved one with a nurturing, comfortable, home-like environment that is attractive and easy to navigate. We foster community and family by hosting many activities and events each month. Residents are encouraged to participate in as many pursuits and outings as they like, appropriate to their ability. No matter what, everyone is treated as an individual person with unique needs. At The Reserve, our residents live life to its fullest as they age in place. 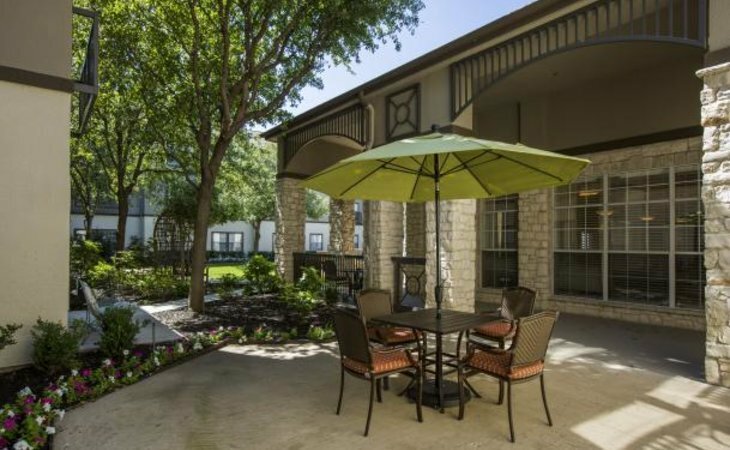 The Reserve at North Dallas offers independent living in Dallas for seniors who are able and inclined to live independently, but crave the comfort, security and social opportunity a retirement community offers. If you are looking for a vibrant, active place to call home during your retirement years, The Reserve will fulfill your desires. Come visit us and see how great senior independent living can be. What should caregivers and potential residents know about The Reserve at North Dallas?